Not just an ordinary coloring book! This is a cool little book for travelers and travel lovers alike that serves to both educate and inspire. In it, readers will find the inspiration and impetus to take note of their touring adventures that they might not otherwise have indulged. 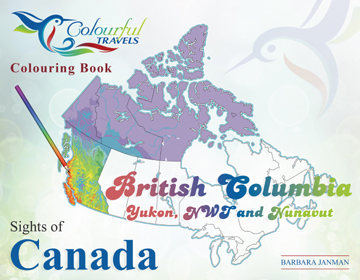 With Sights of Alberta, British Columbia, Yukon, NWT and Nunavut, Canada, readers get a unique combination of history lesson, geography lesson, travelogue and activity book. Whether you’ve visited the sites or not, you’ll feel like you did with unique and Colourful Travels. Proudly printed in Canada and created by Canadian artist Barb Janman.